Anonymous sale; Sotheby's, London, 27 October 1993, lot 145. The artist, a member of the Haarlem Guild of St. Luke from 1610, was one of the more prominent followers of the great father of Dutch marine painting, Hendrick Vroom, whose influence is very clear in the present work. 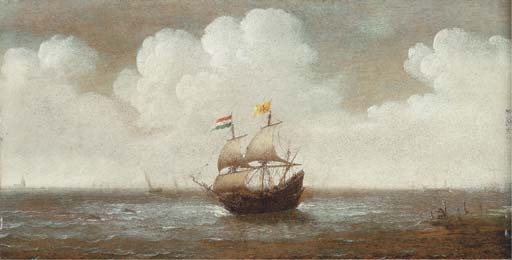 Verbeeck employs many of the devices typical of Vroom's ingenious depiction of light and space, including the strip of land in the foreground (edge), the alternating bands of light and dark sea, and the distant strip of shore on the horizon, with light catching off carefully placed sails receding into the distance. The placidity of the scene depicted belies Verbeeck's more colourful personality. Laurens Bol (Die holländische Marinemalerei des 17. Jahrhunderts, Brunswick, 1973) in researching Verbeeck's life discovered repeated references to the artist's fondness for low life, typified by a document of 1616 in which he gave evidence concerning a young woman who 'went home with a sore bottom' after spending two nights 'cavorting' with two men in a hostelry'; in 1628 he was banished from a tavern and placed under a court order not to 'offend injure or molest' the proprietor. A particular bugbear seems to have been a bleacher called Pieter Bossu, concerning whom he was involved in three offences, the first committed two weeks after his wedding when 'several physicians were summoned to examine [Bossu's] injury' which turned out to be 'a simple flesh wound under the diaphragm'.